The 10 Best Skate Parks in Montana! In Montana, there are hordes of visiting outdoorsman and hunters, long stretches of rural serenity, and a strong tie to agrarian and mountaineering roots. But there exists a flourishing skate culture. And it’s surprising in two ways: First, it exists. Second, quite a few parks are funded and supported by members of Pearl Jam. As famous Montana alums, the band has helped rejuvenate, and often, establish, the skate scene. Here are the 10 best places to skateboard in Montana. Cradled by McCormick Park in downtown Missoula, MOBASH is one of the five best skate parks in the country, according to Amazing Gridline. Thanks to the collaboration between the city and actual skaters, this 15,000-square-foot slab of beautiful concrete features smooth ledges and a good variety of bowls, street and transition sections. Even Tony Hawk gave his seal of approval during the 2006 grand opening. The park’s quality and varied terrain, and the fact that it’s lit all night, makes for skating ecstasy 24-7. Helmets required. Given the size of the town, Big Sandy hosts a very decent skate park, especially after its expansion in 2015. Most notably, it was a donation by Pearl Jam’s Jeff Ament, a gift from the musician to his hometown. Overall, it’s a very welcome addition to the community. The transitions from section to section are smooth and consistent, with solid coping and well-crafted edges. Though the street aspect is less impressive than larger parks, the bowls—of varying depths and sizes—make for a decent mixture of terrains. It’s free and doesn't require gear. This 12,000-square foot monster is the Flathead Valley’s go-to park. Located in Polson, this park is framed by the beautiful south-western edge of Flathead Lake. While many flock to the area for wilderness recreation, the skating isn’t half bad either. The park sports some solid street sections, and an impressive helmet bowl. Step-ups and stairs abound, the varied and sizable terrain assures an entertaining grind session. Free to the public, no pads required and no bikes allowed. South of Polson, Skate Ignatius sits near the humble town’s old church. This over 10,000-square foot concrete collection of quarter pipes, gaps, pyramids and a hefty clover bowl represents another wonder-work by Dreamland Skateparks. The company, primarily based in Oregon, possesses over a quarter century of experience building behemoths throughout the northwest and as far south as Arkansas. Entry is free and no gear is required. Named for its proximity to some gorgeous waterfalls, Great Falls is the third largest city in Montana, and arguably, the first or second in terms of quality skating. The Riverside park is over 27,000-square feet, and alongside Mobash in Missoula, is one of the top five in the Northwest (an impressive feat given the competition from Oregon and Washington). Aside from the quality craftsmanship and size, the park is most appealing in its plethora of options—for beginner and expert alike. There’s a full pipe, half pipes, street sections and bowls (three of ‘em, deep and shallow). Lights allow for evening skating, but when the sun goes down, the property is off limits. No fees required. Dreamland Skateparks locked down another impressive park in Big Sky. It’s a 6,800-square foot plot intended to resemble aspects of the famous Burnside in Oregon. It’s hard to capture that Oregonian lightning in a bottle, but there are admirable similarities that experienced riders may appreciate. That said, according to concretedisciples.com, the “layout and depths, and smoothness really is not comparable. It's a really fun ride though…buttery and no imperfections.” So, while Big Sky may not replicate Burnside, it’s well-maintained, glass-smooth and fast—which may be challenging for beginners. No fees and no pads required. Located in Kirk Park, the Bozeman Skate Park is a 6,000-square foot slab easily found off of Main Street in downtown. Team Pain, a company responsible for some great parks primarily in Colorado and Florida, constructed the park and thus created its biggest asset: The enjoyable lines. Though not the most varied, or certainly, the largest, Bozeman provides a fun ride. A quarter pipe running the length of the park, and a keyhole bowl added in 2013 make for fun transfers from section to section. The crucial variable is how crowded the park is: The small size makes for crowded sessions. If one happens to ride at off-peak hours, the lines are quite awesome. This massive 15,000-square foot park in Whitefish is a well-designed Dreamland product and within a couple hours of two other comparable parks (so it’s worth the drive). Its greatest assets are two-fold: First, it’s immense bowl and extensive and diverse street sections; and second, the absolutely beautiful view. 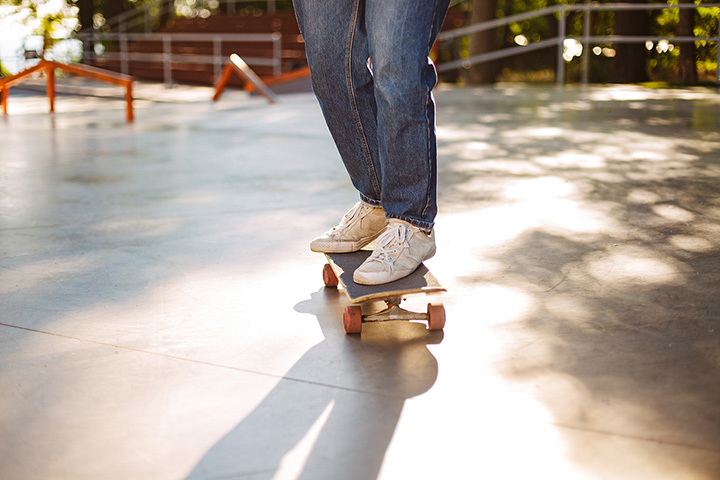 Just over ten years old, the park is still smooth and the concrete dries uncannily quick were it to rain—waiting for a surface to dry adequately is extremely frustrating for the everyday skater. So, drop-in to the steep 12-foot bowl, transfer to the street sections and enjoy the view—that’s skating Montana style. No fees and no gear required. The only indoor skate park on the list, 52 is located just west of town (past the airport) and funded by the 52 Foundation: A non-profit collective of skaters and concerned citizens focused on providing activities for all ages. Within modern, but nondescript, warehouses, the park is composed of Masonite—a flexible, pressure-treated wood substrate—making a smooth ride and more forgiving landing. Being indoor, there is a small entrance fee, but the amenities, lights and protection from weather make for an all day, and all season, ride. And the non-threatening nature of the terrain and emphases on all-ages fun makes for a welcoming atmosphere for all skill levels.